3 Bahadur: Rise of the Warriors all set to release on 14th December 2018 across the country! 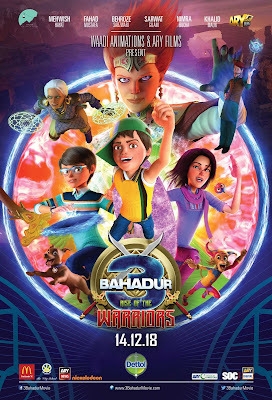 Waadi Animations is all set to release the finale of Pakistan’s first animated full-length super hero film franchise, 3 Bahadur: Rise of the Warriors! With high quality animation and detailing, crowd simulation, top of the line VFX tools, approximately over 5000 hours of animated production by over 30 animators, this is indeed the biggest animated production by Waadi Productions. With Sharmeen Obaid-Chinoy at the helm as the Creative Director, the 3 Bahadur Trilogy has set new industry standards for animated fiction and content geared towards children in the country and its third installment, 3 Bahadur: Rise of the Warriors aims to empower and motivate today’s youth through dynamic 3D animation and an engaging story telling format. An epic story of friendship, teamwork and courage, 3 Bahadur: Rise of the Warriors chronicles the journey of three unlikely superheroes Amna, Saadi and Kamil who have indeed become household names in Pakistan. Indeed, the animated film aims to inspire the next generation to realize that they too hold the power to change the future of Pakistan. For the finale, Waadi Animations introduces two new super heroes: Mehwish Hayat as Erma and Nimra Bucha as Babushka. Voice-actors Zuhab Khan returns as Saadi and Arisha Razi as Amna with Bashar Amir Shafi joining the cast as Kamil. 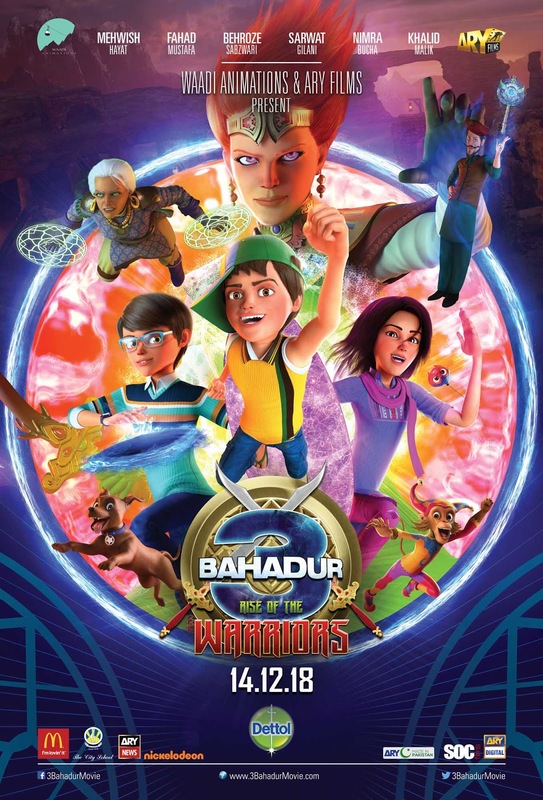 3 Bahadur: Rise of the Warriors also features a star-studded cast of Behroze Sabsvari as Deenu Chacha, Fahad Mustafa as Amna’s father, Sarwat Gillani as Saadi’s mother, Khalid Malik as Kamil’s Father, Faheem Khan as Gunchu and Mustafa Changezi as Tony to bring life to the larger than life animated characters. Waadi Animations also launched a brand new campaign, ‘Apka Bahadur Kaun hai’, nationwide to encourage Pakistanis to highlight all of the Bahadurs they see around them in their family, communities and schools. Synopsis: The film is produced entirely in Pakistan. Based in a fictional town in Pakistan, Roshan Basti (Town of Light). The plot revolves around now fourteen year olds Amna, Saadi and Kamil, who are happy that they have gotten rid of all the evil from their town – unaware that there is new visitor in town who brings massive amount of trouble with her. A warrior queen, Erma, arrives in town, escaping from another world, disguised as a circus performer she turns to the 3 Bahadur for help to defeat her nemesis Babushka. Deenu Chacha and the 3 Bahadur find themselves divided on whom to side with. Roshan Basti experiences a devastating drought which could spread all over the world – now it’s up to the Teen Bahadur to save the world.